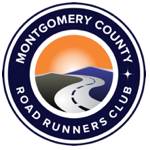 MCRRC was incorporated as the Upper Montgomery County Road Runners Club (UMCRRC) in February, 1978, with “the prime object of the association being the promotion and encouragement of long distance running.” With nods from neighboring running club DCRRC and Road Runners Club of America president Jeff Darman, the club became an RRCA member in July, 1978. With Jack Kaminski as its first president, UMCRRC hosted its first large race that August. The 8-mile Rockville Run (later the Rockville Lung Run 10k, and now the Rockville 10k) had 500 finishers. More typically, club races had 8 finishers in the longer distance, and seven in the fun run. The first issue ofThe Rundown was published in September, 1978. It was one page, financed by an annual budget of $718, and mailed to all of the club’s 20 members. The next year, the club shortened its name to MCRRC, adopted its current logo (the “meatball”), and elected Ray McInerney as president. He served 3 ½ years until replaced by John Sissala in 1982. During the McInerney administration, the club initiated many programs in place to this day. The Board decided to conduct two races per month (free to members), complemented by a Participation Awards series the following year, which became the current Championship Series in 1983. It established the club’s first racing team (a women’s team competing in the Bonne Bell 10k in DC). New member Anna Berdahl organized a group of club members to prepare for the Marine Corps Marathon, the precursor to today’s marathon training programs. The “Runner of the Year” Award began in 1981 (featuring winners John Sissala and Joanne Mallet). By the end of decade, membership had grown to nearly 200, and the annual budget to $1,832. Throughout the 1980s, MCRRC continued to grow in both size and the scale of its activities. The club hosted its second big race, the Shady Grove Adventist Hospital 5 miler in June 1980, with 400 finishers. Under the presidencies of John Sissala, Tom Rozanski, Bill Hall, and Denny Steinauer, membership increased significantly, from 455 in 1981 to 1770 by 1989, and the budget rose to over $38,000. Regular Wednesday night track workouts began in the summer of 1983, the same year MCRRC began renting a room for club participants in the Marine Corps Marathon. The club was asked to stage the popular Fritzbe’s 10k in Rockville, which grew from 1700 participants its first year (1983) to 4000+ by 1990. It hosted the RRCA Convention in 1987, during which The Rundown (and editor Bob DiIorio) won the RRCA Outstanding Club Newsletter award. The following year, additional honors went to Denny Steinauer as the RRCA Outstanding Club President, and John Sissala as the RRCA Outstanding Club Volunteer. While Fritzbe’s (both restaurant and race) folded in 1993, the Wednesday night track workouts and the “Marine Corps Room” continue, as does the Rockville Twilighter 8k, inaugurated in 1985, and the Halloween Young Run, first run in 1988. MCRRC members continued to represent the club as organized teams in local races, including the Marine Corps Marathon and the 24 Hour Relay. The 1990s saw similar growth. Under MCRRC Presidents Kari Keaton, Irv Newman, Phil Quinn, Brian Tresp, and Don Carter, membership continued to increase. It topped over 3000 by the end of the decade, making MCRRC one of the largest RRCA clubs in the country, and one of its most active. The club’s motto, “we are running in Montgomery County,” was evident in the increasing number of training programs and races – large and small – such as the First Time Marathoners, the Cross Country Series, and the first annual Pike’s Peek 10K in 1996. RMS (Race Management Services), the club’s paid, professional arm established to administer races for outside organizations, began increasing its activities, raising the club’s revenue stream for additional programs and events, such as the movement of the annual Christmas Party from the Rockville Senior Center to the Needwood Mansion, the popular XMP (Experienced Marathoner Program), and other coaching programs. Since 2000, with a $100,000+ budget and over 2,500 members, MCRRC continues to increase its race offerings, and especially its training and coaching programs. The Seneca Greenway Trail Marathon/50k, and Stone Mill (Trail) 50 Miler, the Beginning Women’s Running Program, Speed Development, 8k Training, and numerous weekly training runs (both on- and off-road) were all creations of the new millennium.